The presidents of Ukraine and Turkey discussed the situation in the east. Ukraine is interested in Turkey's boosting its presence in the OSCE monitoring mission and expects it to support the initiative to deploy UN peacekeepers to war-torn Donbas, President Petro Poroshenko has said after his meeting with Turkish President Recep Tayyip Erdogan in Kyiv on 9 October. 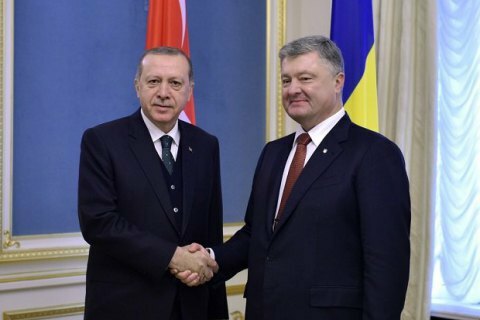 Poroshenko thanked Turkey for its firm support for Ukraine’s sovereignty, territorial integrity and independence, as well as unequivocal non-recognition of the illegal aggression of the Russian Federation against Ukraine and the illegal annexation of Crimea. "We would be really interested in Turkey's increasing its presence in the OSCE SMM. We are grateful for a well-coordinated work of the special monitoring mission headed by the Turkish representative. In the near future, Turkey's support for the deployment of a UN peacekeeping mission in certain areas of Donetsk and Luhansk regions will be of particular importance to us," Poroshenko said, noting that the given issue had been discussed during the negotiations.